Whilst you're patiently waiting for me to finish force feedback support in Cannonball (it's going well), here's a Space Harrier Easter Egg for you to try. 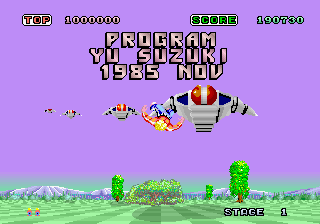 It's similar to the OutRun egg, in that it provides a Yu Suzuki development credit, along with the development date. Interestingly November 1985 was around the date the AM2 team started OutRun, which probably explains why the team used the Space Harrier code as a framework to work from. Like most AM2 titles, the egg is somewhat tricky to activate. You need to enter the code during the death / respawn sequence; therefore after the character collides and flips upwards or is flashing. Press button 3 (typically mapped to space on MAME) six times. Press the start button eight times. Then finally, press button 3 again. You should see the message. You can enter the code over multiple iterations of this death sequence. So you can start after the first time you die, and complete it the second time you die. However, any error in input resets the code, so go carefully. Thanks a million for your work !